The North Dakota Democrat is one of the GOP's top Senate targets in the midterm elections. Those are the kind of deep connections the first-term senator is banking on to shelter her from the coming waves of Republican attacks in what is billed as one of the most competitive races in the country. Heitkamp is, after all, a Democrat in a ruby red state that President Donald Trump won by 36 points in 2016. And she will face North Dakota's at-large GOP congressman, Kevin Cramer, in the general election this fall. Affectionately known simply as Heidi by almost everyone in the state, the junior senator has expanded her network far beyond Mantador, the small town of 80 residents where she was raised as part of a family of seven children. Now she floats effortlessly through the state with a population over 750,000 who could help determine the balance of power in the United States Senate. 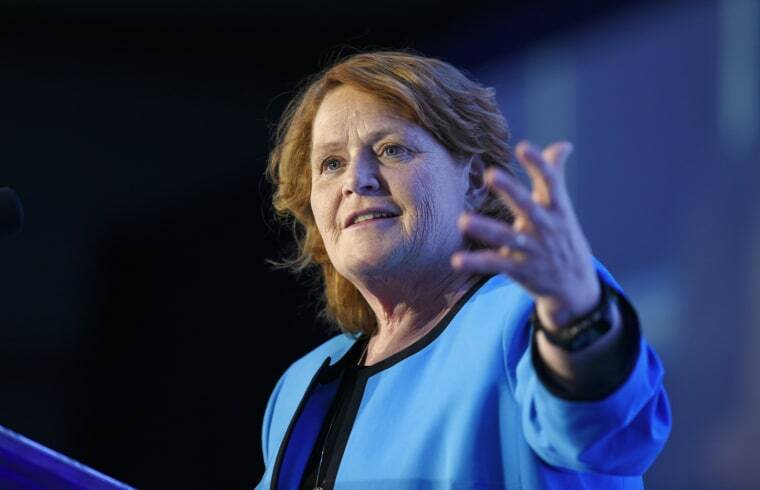 With the Senate in recess last Wednesday, Heitkamp, who prides herself on rarely wearing a coat even in below freezing temperatures, spent the frigid day making and remaking connections, traveling to five events in four towns. In each location, her connections to the state and the people were on display. Heitkamp noted that her cousin works at a local television station in Fargo. A little girl at an elementary school presentation in the town of Mayville showed Heitkamp a six-year old newspaper clipping with a picture of the two of them. She asked Heitkamp for her autograph and and a hug. Over lunch in Hillsboro at the only cafe in town, fellow diners constantly interrupted her lunch to chat. One gentleman picked up her tab. Despite that coziness, she is still a Democrat from a rural state in a country that is increasingly politically and regionally divided. And Heitkamp has spent her first term in the Senate straddling those competing dynamics. She has bucked her own party in Washington on many occasions. She sparred with Massachusetts Senator Elizabeth Warren over a roll back of some banking regulations, she was one of a dozen Democrats who voted to re-open the government even though no deal was reached for Dreamers, she supported most of President Donald Trump’s cabinet nominees and she voted to confirm Supreme Court Justice Neil Gorsuch, contributing to the president’s first and perhaps most consequential victory during his tenure. Even after the Parkland shooting, she hasn't budged on her opposition to gun restrictions, still opposing expanded background checks and any limitations on gun purchases. But her Republican opponents point out that she has also sided with her party many times, too. Most notably, she voted against the tax reform bill and she opposed efforts to repeal of the Affordable Care Act. A member of the self-named bipartisan Common Sense Caucus of Senate moderates, Heitkamp says it’s not about politics but policy. “Honestly, I think, 'what do we need to do for North Dakota,'” she said. In rural Mayville, a town of 1,600, Heitkamp visited the only coding class in the state available to rural high school students. She said North Dakota has been left out of the tech boom but classes like this will help narrow the opportunity gap. For instance, in the Washington, D.C. area, coding classes are available to first graders. Heitkamp sipped Diet Coke in between events as she juggled her official duties as senator with her place in the campaign spotlight in this election year. While most of Wednesday's events revolved around her stated passion for children's issues, especially those who have experienced trauma, the escalating trade war over tariffs back in Washington kept creeping into conversations. It's an issue important to North Dakotans, which are overwhelmingly white, rural voters — just the type that the Democratic Party has been struggling to attract. Despite Trump’s popularity in the state, one of the highest in the country according to Gallup, Trump's actions could be making her chances for re-election a bit more rosy. At the Hillsboro Cafe, a farmer walked up to her to say hello and the conversation quickly shifted to tariffs, something the farmer said is “a big deal,” calling it a “double whammy” for his business. The escalation of a trade war would hit farmers especially hard because Trump’s tariffs on steel imports could raise the price of equipment. Simultaneously, China’s retaliatory tactic — a tariff on more than 100 exports, including soybeans — could crush North Dakota farmers if they lose a major buyer in China. The state’s farmers export $1.5 billion worth of soybeans to Asia. “We’re going to fight the fight,” against such measures she told the farmer, although Congress has little authority in trade matters. Mike McFeely, who hosts the local talk radio show at WDAY in Fargo, told Heitkamp during a commercial break that the longer the tariff fight goes on, the better it could be for her re-election chances, although there hasn't been any recent polling on the state of the race. Heitkamp, who adamantly opposes the tariffs, didn’t directly address the premise whether the issue would help her in November but she did launch into her broader campaign theme — that she serves as a check against the president. “We don’t need a Trump apologist,” Heitkamp said, referring to Cramer, her Republican opponent. Cramer, who reluctantly jumped in the race to challenge Heitkamp after repeated calls from the president, told NBC News that he and Heitkamp have similar positions on the tariffs and he is against them in general. But as an ally to the president who ran on the issue, Cramer said he thinks this is all part of the negotiations. He echoed a similar thread line from some of Trump’s advisers who say that it might be temporarily painful. But for some voters in North Dakota, choosing between Heitkamp and Cramer is going to be difficult. They were elected statewide by voters for the first time to Congress on the same day five years ago — Cramer to the House and Heitkamp to the Senate. Mac McClennan, the CEO of an energy cooperative, Minnkota, which sells coal, wind and hydropower to its members, says that he’s a huge fan of Heitkamp and she’s been extremely supportive of his priorities of not only ensuring that coal is and renewable energy is abundant in the state but also her willingness to help deal with coal emissions. Heitkamp took the lead on a little-reported carbon capture bill earlier this year. But McClennan says Cramer has also been supportive as well. And he likes both of them personally, too. “It’s going to put individuals like us in very difficult position,” he said. Cramer says that sort of divided loyalty is a sign that the upcoming campaign should focus on the issues, adding that a negative turn by either candidate won’t do well with North Dakota nice. Heitkamp said that women in the state have reacted poorly to a campaign television ad by the billionaire activist entrepreneurs Charles and David Koch’s group Americans for Prosperity. The group hired a body double and women brought it up through out the day. “You’re shoes are much nicer,” one young woman said to her at a discussion with social workers who help children in foster care. In between bites of soup, a woman walked up, thanked her for her service and complimented her electric blue blazer. “If only we could have gotten that body double to wear a nice suit,” Heitkamp said, a quip that elicited a knowing laugh. “To lead with an ad that is so unliked is not a good beginning,” for her opponents, Heitkamp asserted. But she will have to wait another six months to find out whether her own likeability will be enough to send her back to the Senate for a second term.